It’s been just eight years since Apple’s iPad changed aviation forever, ushering in an era of portable electronic devices that can not only carry all the charts needed to fly anywhere in the world but also provide the ultimate in situational awareness with moving maps and AHRS-driven synthetic vision displays. The landscape of the aviation app arena has changed dramatically over those eight years. What started as a simple alternative to paper charts has turned into full-blown electronic flight bag (EFB) apps that took the concept further than ever conceived and upended the traditional PC-based EFB market. At the same time, the tablet-based EFBs running Apple’s iOS, Google’s Android, or Microsoft’s Windows operating systems are now the computers that flight crew carry to help run their operations. The number of applications or apps that run on these devices has also grown rapidly, and the choices for organizations and end-users has likewise expanded. One element hasn’t changed, and that is iOS’s dominance among the EFB apps. Android devices have a decent amount of support, with Windows still not heavily supported by aviation app makers, although there are some interesting developments for Windows users. The big news late last year was Garmin’s purchase of free flight-planning service FltPlan. The addition of FltPlan’s capabilities gives Garmin not only new revenues from flight-handling services provided by FltPlan but an instant entree into the Windows EFB market. The FltPlan Go app is still the only EFB app that runs on all three operating systems (Android, iOS, and Windows). The Android operating system is here to stay, and for those who don’t want to be beholden to the Apple ecosystem, Android offers a perfectly useful alternative. Android tablets and phones tend to be much less expensive than their Apple iPad counterparts, and this could provide a reasonable way to set up a backup system. 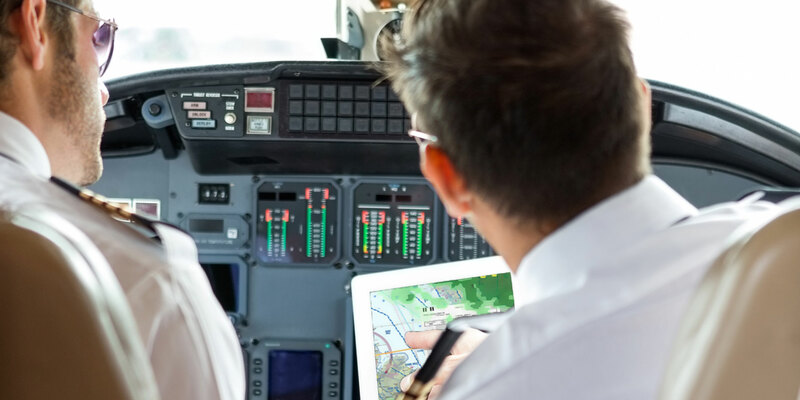 While it isn’t required that pilots carry paper charts as a backup, having two devices running different operating system could be a good way to provide a backup in case a problem develops with a particular operating system. Apple users have a bunch of new choices for hardware, and even some reduced prices in the iPad arena. The entry-level iPad now costs just $329, although with just 32 GB of storage, this unit is not terribly useful if needed to run more than one EFB app and some other smaller apps. Notably, the basic Wi-Fi version of the iPad does not include a GPS receiver; this is found in the cellular/LTE version, which starts at $459. The newer versions of the iPad are the Pro, and the latest is the 11-inch version with 64 GB of storage. The 11-inch Pro fits a sweet spot in iPad development, being not much larger than the traditional 9.7-inch devices because the edge bevels are much smaller. Keep in mind that the Pro iPads use Apple’s Face ID instead of the fingerprint sensor, so if you mount the iPad in a position where it can’t get a good view of your face, you may have to unlock it using a passcode. There are an uncountable number of Windows-based lightweight computers available from a variety of manufacturers, but for true tablet-like operation, Microsoft’s Surface series are the go-to devices. The latest is the Surface Go, a lower-cost ($399, 64 GB) lighter device that is still powerful enough to run aviation apps. Sadly, the level of EFB app development for Windows remains at a relatively low level compared to Android and iOS, but for those who really want the Windows experience, there are solutions such as Garmin’s FltPlan Go, Jeppesen FliteDeck, and Logipad. What makes the Surface tablets useful for aviation operators is that they provide an easy transition to tablets for operators who already use Windows programs. Aerovie’s EFB app offers all the expected EFB features including geo-referenced maps and charts, weather overlay, synthetic vision, and flight planning and filing. A unique Aerovie feature is an automatic warning of hazards such as icing, IMC, and convective available potential energy values according to the planned route and time of departure. The app displays an information-rich vertical weather profile showing how forecast weather will affect the route of flight. Creation and submission of pilots reports is another Aerovie strength, and for internet-connected aircraft, pilots can submit reports right away. Aerovie is also one of the few EFB apps compatible with the Apple Watch, with functions that include multiple timers, airport information and weather, automated landing briefing, and checklists. Aircraft Performance Group (APG) launched its new flight-planning app—iPreFlight Genesis—at last year’s NBAA show. Genesis picks up where APG’s iPreFlight app leaves off, adding a new flight-planning engine to iPreFlight’s weight-and-balance and runway analysis modules. With Genesis, pilots, dispatchers, and flight operations staffers can plan and file a flight plan after loading up the airplane and evaluating runway performance capabilities, which include takeoff and landing data for that particular airplane. The analysis shows the departure procedure for each runway and the weight limits calculated by APG’s Max Payload Estimator. Genesis optimizes the flight plan based on winds and temperatures aloft using the SelectRoute tool, which also offers recently cleared and preferred routes. Genesis has an autorouter that automatically plots the route based on the aircraft settings. For example, a non-RNAV-capable aircraft won’t be given a flight plan that it can’t fly, or an aircraft without life rafts won’t be given an overwater route. The flight planning capability is available when the app is not connected to the internet, and in this case, Genesis taps its historical weather database to help the user determine whether the route can be flown and to provide an overall view of the trip. Avare is one of the few completely free Android EFB apps and is fairly comprehensive, with geo-referenced FAA maps and charts, and in addition to U.S. maps, includes coverage of Puerto Rico and parts of Canada, the Caribbean, and Mexico and terrain maps for most of the world. A handy Avare feature is a “GPS compass direction,” where a long press on a point on the map shows bearing and distance to and from that point. Add-on apps provide more functionality without burdening the core software. Examples include an external I/O plugin to enable use of ADS-B In and GPS receivers via Bluetooth or WiFi and a Bluetooth GPS plugin for use of a second GPS-equipped Android device as the position sensor for one or more non-GPS-equipped devices running Avare. AvPlan’s EFB app is one of the other apps that comes with Apple Watch functionality, but its global flight-planning and flight plan filing make it a viable option for business aviation users. AvPlan can gather weather information globally and includes weight-and-balance, geo-referenced maps and charts, terrain profile view, preflight briefings, and integration with flight-planning services such as RocketRoute and SkyVector. AvPlan flight plans can also be shared with Jeppesen Mobile FliteDeck. Other AvPlan features include synthetic vision, glide range display, and “virtual copilot” with runway, terrain, airspace and frequency change warning, both audio and in the app. AvPlan also allows sharing of crowdsourced weather information. Apple Watch features include Zulu time, flight time, endurance, four timers, and nearest airport with Metar. The Lite version (available for both Android and iOS and the only version available for Android) has reduced utility but could serve as a useful charts backup system; iOS users can install the Lite version on an Android device for no additional cost. EFB-Pro is a full-featured weight-and-balance and performance calculator with information based on OEM performance data. Performance calculations can be done offline with user-input weather information, or with an internet connection, current airport weather is used to determine runway performance and generate a TOLD card. Cavu’s PCast performance forecasting shows a quick “view of takeoff performance as a function of temperature,” according to the company, enabling the user to vary “what-if” parameters for various departure times. EFB-Pro also offers fuel tankering analysis, including taking into account FBO fees and fuel rebates, as well as deice fluid holdover time calculations. The CloudAhoy app is a debriefing tool useful for pilots and flight instructors, allowing detailed postflight examination of a flight. The quality of the debriefing depends on the quality of the data captured, ranging from a portable GPS or GPS-equipped smart device to comprehensive data recorded by onboard avionics. But even with just GPS data, the CloudAhoy debriefing is highly detailed and accurate, deriving information from a rule-based knowledge engine. Data can be captured using CloudAhoy running on a smartphone or tablet, or from other apps that capture flight data such as Garmin Pilot and ForeFlight, onboard avionics, and external GPS devices. Debriefing is done on the CloudAhoy website and displays various 2D and 3D views, from outside and inside the cockpit, along with overlays of instrument approaches, and easily viewable depictions of maneuvers. Users can sync flight video inside CloudAhoy to view a side-by-side depiction of the debriefed flight alongside the video. One of the few aviation EFB apps available in both iOS and Windows versions, Logipad is highly customizable and can be managed remotely from any browser. The Logipad app is populated by information from the customer’s flight-planning system, which synchronizes with the app. The flight-planning system must support the Arinc 633-2 electronic flight folder standard. Various document types are supported, and the administrator can restrict document actions by users such as printing, copying, sending, and releasing. DroidEFB is a full-featured Android-based app with geo-referenced maps and charts, weight-and-balance, integration with AOPA’s Flight Planner, and it works with a variety of ADS-B In and GPS receivers. Like most EFB apps, DroidEFB users can test it using a PC simulator such as X-Plane to learn the app before taking to the skies. Other useful features include drawing/writing on maps and charts, fuel prices, vertical speed required, a runway finder tool, flight plan briefing and filing, search-and-rescue patterns, flight log sharing, and external SD card storage. Garmin’s purchase of FltPlan gave the company instant entree into the Windows world with the free FltPlan Go app, which also runs on iOS and Android devices, giving users enormous flexibility and an easy way to carry a backup on a separate device running a different operating system. FltPlan Go offers all the EFB capabilities and it is tightly integrated with the FltPlan website and its flight planning tools. FltPlan Go allows pilots to overlay approach charts on the map and add layers for weather, wind, etc. The iPad version of FltPlan Go works with AHRS devices (like those included in some ADS-B In receivers) to provide attitude information on the instrument page. Departure and arrival procedures can be displayed with transitions on the planned route. Other features include weight-and-balance, elogbook, a cloud tops tool, integration with AOPA Flight Planner, and built-in calculators. ForeFlight has carved out a significant share of market in the business aviation arena. For pilots traveling all over the world, ForeFlight offers worldwide flight planning services and integration with Jeppesen maps and charts. The flight planning functions were augmented when ForeFlight purchased European flight-planning software developer AviationCloud. It also purchased JetFuelX, a fuel-planning provider. The Performance Plus version of ForeFlight includes all the moving-map, weight-and-balance, logbook, charts and maps, weather, and checklist features in the Basic Plus version and additional features from Pro Plus, such as geo-referenced maps and charts, synthetic vision, hazard alerts, and terrain profile. Performance Plus brings features optimized for business aircraft, including performance profiles, time and fuel calculations, optimized autorouting, pre-departure clearance and D-ATIS, fuel load planning and limit checks, integration with JetFuelX as well as fuel orders and releases, and the new Trip Assistant. This tool allows users to plan a trip door-to-door with estimates for ground and air time included along with fuel stop planning. Garmin Pilot is tightly integrated with Garmin integrated flight decks and avionics. With Garmin Pilot and Garmin’s Connext system, users can update onboard databases, share flight plans, and download flight data. The Pilot app has worldwide weather and mapping information and can integrate with Jeppesen maps and charts for global operations. IFR flight planning is available in the U.S. and Europe. With its purchase of FltPlan, flight plans generated in FltPlan can now be imported into Garmin Pilot. The freehand flight planning mode allows users to draw a flight plan on the moving map, and the app automatically creates the flight plan with airports, navaids, and intersections for the route. The app supports full EFB features including flight plan auto-routing, weight-and-balance with an available library of aircraft with built-in cruise, climb, and descent performance, geo-referenced charts and maps, profile view, synthetic vision, and pilot logbook. Unique Garmin Pilot features include Smart Airspace, which highlights airspace that is at or near the aircraft’s altitude to avoid nuisance warnings about airspace that won’t impact that flight. For traffic display, Garmin’s TargetTrend and TerminalTraffic provides improved views of aircraft trajectories and closure rates (TargetTrend) and aircraft and ground vehicles equipped with ADS-B Out on the airport surface (TerminalTraffic). WingX pioneered many features that are standard in today’s EFB apps, including synthetic vision, split screen, terrain warning, and search-and-rescue functions. With geo-referenced charts and maps, WingX offers weather data from Baron Velocity Weather. WingX’s unique “traca” feature allows pilots to trace a route on the screen around weather, airspace, etc., and the app automatically creates a set of waypoints along the new route. A new feature is downloading of flight plans from the AOPA flight planner. WingX also provides routing on the moving map for departure and arrival procedures and instrument approaches (iPad only). Honeywell’s GoDirect Services have grown to cover the entire aircraft, from monitoring and managing airframe components and systems and engines to apps designed for pilots. Two such apps are Flight Bag Pro, a full-featured EFB app, and Flight Preview, which allows users to preview flying an instrument approach on their tablets to gain familiarity before flying the actual approach. Flight Bag Pro is a worldwide flight planning system with weather information and route forecasting. Cruise optimization, fuel burn/time calculations, and weight-and-balance data are from Honeywell’s GoDirect Flight Engine and based on OEM flight manual information and aircraft-specific weights. Pilots can download trip kits and use Jeppesen maps and charts. Trip support is available from Honeywell flight data specialists and dispatchers. The iFlightPlanner app is part of an ecosystem of flight-planning and EFB tools and is tightly integrated with the iFlightPlanner website. The iFlightPlanner EFB app is designed for flying in the U.S. and among its many features offers flight-planning with auto-routing, weight-and-balance, geo-referenced maps and charts, Baron Velocity Weather, cockpit voice recorder with auto-pause, instrument approach timer, pilot log, and flight plan integration with Jeppesen FliteDeck. For subscribers to Jeppesen data, installing its Mobile FliteDeck or FliteDeck Pro app makes sense, because users often have an unused Jeppesen product key that can provide the data for the app. (FliteDeck Pro is also available for Windows devices.) But Jeppesen offers a more integrated experience with its Aviator “all-in-one” app that combines a suite of EFB tools in one application. Aviator brings together FliteDeck’s geo-referenced maps and charts, airport moving map, and navigation capabilities plus tools for flight briefing, weather, performance, flight optimization, content viewing, and other utilities such as a calculator, unit conversions, timer, stop watch, and a deicing holdover timer. Users can integrate their company’s own applications with Aviator, including, according to Jeppesen, “any integrated EFB application, Ground Web Service, or Dynamic Data Distribution providing ARINC 633-1 or 633-2 formatted flight folders.” Jeppesen’s Trip Kit on Demand is also integrated with Aviator, so data for a particular trip is always available. Aviator users can share data, flight plans, and trip kits with each others’ devices. FlyQ’s latest version adds a number of new features to this popular EFB app, including wireless Seattle Avionics ChartData transfer to onboard avionics, recently cleared IFR route, a buddy list that highlights selected airplanes when displayed as ADS-B targets, and ADS-B tail number display. Integration with the FlyQ Online flight planning system is standard. The terrain X-ray feature allows the user to examine the terrain layout in any direction by touching the screen to pop up a terrain view bar that highlights the tallest obstacle in the direction that the bar is pointing. Users can change text size or pop up a larger text box in various areas such as Metars and TAFs to make them easier to read. Charts can be overlaid on maps, and the app can run in a split-screen mode. Synthetic vision is included and provides attitude information when coupled with an AHRS. FlyQ works with more than 20 ADS-B In receivers. FlyQ also includes checklists. One of FlyQ’s most popular features is augmented reality, which shows airport markers overlaid on video from the iPad or iPhone, by pointing the device’s camera outside the airplane. The AviationManuals ARC Safety Management app is designed to work with the company’s web-based safety management system (SMS) service. The SMS and web service are designed for all sizes of operations and are modular, customizable, and embrace a philosophy of simplicity to encourage participation in the SMS process. The modularity allows operators to use only the functions needed, and AviationManuals will customize certain modules to fit the operator instead of forcing conformance with a rigid system. ARC Safety Management’s functions allow operators to “manage documents; analyze data; manage, read and initial; track communications; create internal audits and quizzes; develop surveys; open chat rooms; monitor the progress of SMS within their department through metrics; and more,” according to Aviation Manuals. Late last year, AviationManuals added a metrics module populated with core data. This allows users to provide AviationManuals with safety performance indicators and metrics that serve their operations’ needs and also will help the metrics module evolve. Ergo 360 was first developed to help dispatchers and pilots calculate emergency options based on fuel and oxygen supplies and depletion rates and incorporate that into safety management systems. Recently the ADS team added a new feature to its Ergo 360 iPad app, graphical information about ships, depicted on a map of the flight-planned route. Ergo 360 users can now download ship information before takeoff and, if equipped with airborne connectivity, update the information during the flight. Knowing the ships’ position, velocity, and name can help pilots during an emergency requiring an immediate landing or ditching. Pilots can even communicate with ships using a low-cost marine handheld radio, something that ADS recommends that over-ocean pilots carry in their kitbags. The ship information is derived from the Automatic Identification System that tracks about 230,000 vessels worldwide.